When I think about the people I admire and trust, I realized that one commonality is that I never hear them talk about other people negatively. They will lift others up, even if it is a competitor. I once had a friend talk about a colleague who got a promotion over her (one that she desperately wanted and thought she had). I wouldn't have blamed her if she talked negatively about the guy who did get the job but instead she said "He deserved the promotion. He worked as hard as I did. This just shows me that I need to hone my skills further. I'm going to meet with my mentor so I'm ready the next time an opportunity comes along." This shocked me. I was expecting her to be furious. I respected her for taking this approach. It was such a lesson in grace. I think about how often we tend to talk negatively about people. We don't mean to hurt anyone when we say something negative about someone behind their backs, but when we do this, it just makes people around us think that we will do the same thing to them when they aren't there. I think about the times I was in a conversation when we were talking negatively about someone. I felt dirty, especially if it was a friend. Several years ago I made it a point to stop talking behind someone's back. I wouldn't take part in these conversations. I realized though, that you can take this one step forward. 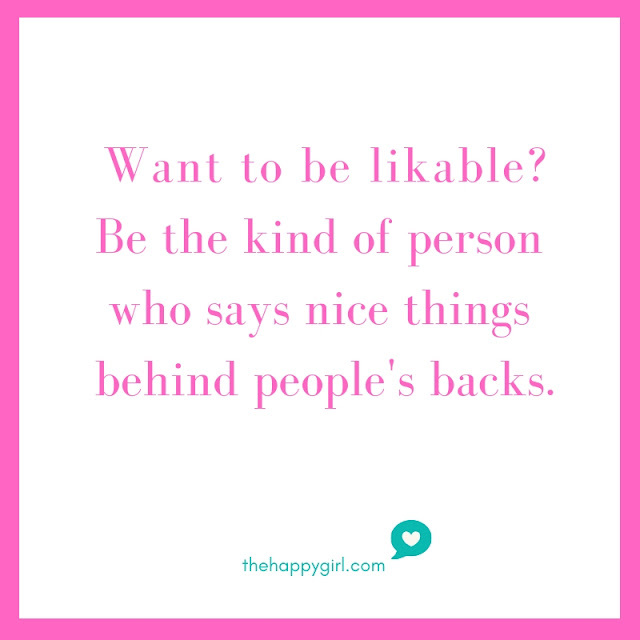 If you want people to like you, to trust you, if you want to feel good about yourself, talk positively about someone behind his or her back and mean it. It's a lesson that I practice every day. It can be a challenge at first when everyone around you is gossiping and it feels harmless to join in but there is no such thing as harmless gossiping. Be the one who stands up for someone. Be the one who has someone else's back. Be that person who can be trusted.